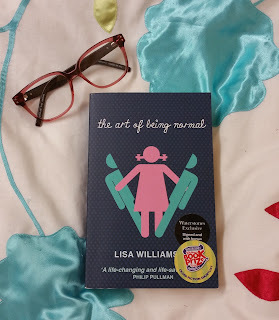 I was so unbelievably excited when I wandered down to Waterstones after a big coursework deadline to finally reward myself with The Art of Being Normal. I had heard such good things about it and oh my was I not disappointed! The plot follows the lives of two guys: Leo who is new the new kid at Eden Park School, trying his best to go unnoticed, and David who is struggling with identity, knowing deep down that he is a girl, but not really being sure what to do next. One day Leo stands up for David in a fight, and a friendship slowly develops between them. Leo is a mystery and rumours are flying about as to whether or not he was expelled from Cloverdale, a school which is renown for being a great deal more rough than Eden Park. Everyone wants to know who he is and what he's doing there, even though barely anyone has even tried to talk to him. Slowly, as is the way in high school, a great many secrets work their way out of the woodwork and the truth is revealed. The Art of Being Normal has it ALL, I laughed at the characters being dorks, I squealed as the story twisted in ways I wasn't quite expecting, my heart broke and mended itself over and over but most importantly I loved every single word of it. There aren't that many books out there featuring trans people, but The Art of Being Normal covers the area so well whilst still giving the characters a chance to shine as individuals. Struggling with gender identity is tough but this book also focuses on issues that everyone has to deal with at some point regardless of their gender and it is that which makes this book so special. It isn't just a book about a boy who wants to be a girl, it's a book about two people who are struggling to come to terms with every aspect of themselves, leaning, somewhat reluctantly, on each other for support and that is so damn beautiful. Read this book. I insist! Everybody should experience the spectacularly sensitive and enlightening way that Williams gives insight into the troubles faced by trans individuals, a topic that is not given enough time, whilst creating a story which is an absolute joy to read. Go, right away, read it!! I found this to be such an insightful read and I wish more YA books tackled the T of LGBTQA+. I mean, the entire community needs more representation and to be normalised, but it was so refreshing to see trans characters being handled in - what I thought was - a great way. I completely agree, any LGBT+ YA books are fantastic but The Art of Being Normal managed to look at one of the potentially more complex areas of the community in such a respectful way whilst also making the characters more than just their "letter". Which is something you really don't see very often!